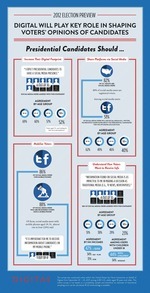 Just as it did four years ago, digital media will play an integral part in the upcoming 2012 Presidential election. 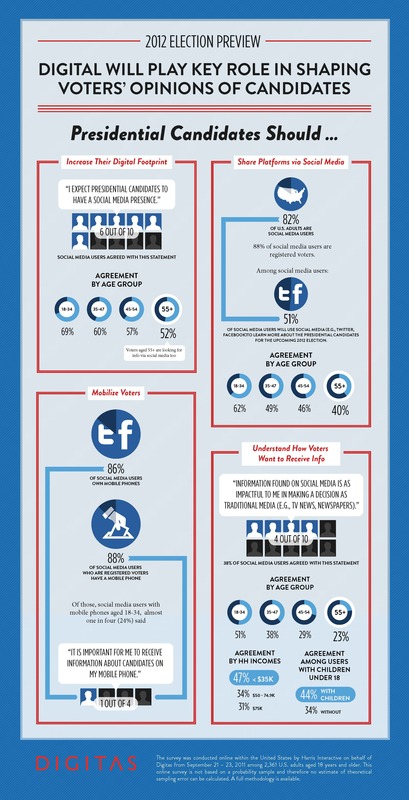 A new study and infographic from Digitas finds 61 percent of social media users expect candidates to have a social media presence and 38 percent say candidate information found on social networks will influence their vote. Unsurprisingly, younger folks (18-34) were most likely (51%) to say social networks will influence their choice of candidate. Eighty six percent of social media users own mobile phones. Of these, 24 percent aged 18 - 34 feel it's important to receive information about presidential candidates on their mobile phones. The study also found that 88 percent of social media users who are registered voters have mobile phones. The survey was conducted online with the United States by Harris Interactive on behalf of Digitas from September 21 - 23, 2011 among 2,361 U.S. adults aged 18 years and older, 1,701 of whom are registered voters.